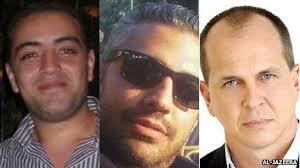 Could it be that the three Al-Jazeera journalists have been found guilty and each sentenced to seven years in jail to enable Egyptian President Abdul Fattah al-Sisi to pardon and free them in order to give the impression that he is a kind, forgiving man and not on his way to becoming the Arab world’s most ruthless and repressive tyrant? Only the coming days or weeks will give us the answer but while we wait I think the governments of the world should act. What could they do? For starters they could isolate Sisi’s Egypt diplomatically by expelling its ambassadors and withdrawing their own. On the social networks there was instant and universal condemnation of the Egyptian court’s politically motivated decision but there is no reason to suppose that governments will act. The U.S. has, in fact, rewarded Sisi for his intimidation and suppression of all opposition to date. The day before the Egyptian court delivered its decision, U.S. Secretary of State John Kerry was in Cairo and with him came the announcement that the U.S. has released $575 million in military aid to Egypt that had been frozen since the removal of President Mohammed Morsi in a coup last year. If Kerry and his boss truly believe that Sisi has any intention of upholding those rights and freedoms they are, to say the least, naive in the extreme. I find myself wondering what America’s position will be when in that fight Egyptians turn against Sisi. Unbelievable hypocrisy from Kerry. The military aid would not be delivered if Sisi's coup was found to be a "coup" which it was. By law, the aid then had to be suspended. But Obama made no "finding" on the matter, and hence it maybe wasn't a coup (which it was) after all. Without a finding, it could have been a "coup" or not, but we will never know. Obama is just going along with the idea that it was probably not a coup, though it could still be. These are lawyer's tricks. Voting for Obama was the most shameful thing I ever did and I won't be tricked by these "dems" again. Why do Americans tolerate these liars? Gen. Sisi, Al-Jazeera and John Kerry, are all "Agents of Zionism". Al-Jazeera, is BBC of Arabic world - while both Sisi and Kerry have Jewish roots. Their assignment is to finish the Muslim Brotherhood and its supporter Hamas as resistance to Israel.